For the last few years, an annual ritual of mine has been to completely detach from all of the projects and people around me, find the place with the fastest internet that I know of, and ‘wire in’ to the live stream of one of the most exciting, Behavioural Science conferences out there, Nudgestock. Over the years this 'festival of behavioural science' has had speakers explore everything from behavioural finance to evolutionary psychology. It’s one of the only places in the world where we can access, share and debate ideas from the industry’s most brilliant minds like Richard Thaler, Laurie Santos, Kelly Peters, Dan Lockton, Colin Camerer and, of course, Rory Sutherland. I always saw it as an enjoyable update of my knowledge and views on a network of subjects that were directly in line with Gravity's mission. This private ritual became a bit more of an event last year, when Gravity Ideas hosted a public viewing of the conference at our then shared office space at 75 Harrington Street, Cape Town. The screening was a great success, attracting both intentional enthusiasts and curious locals to our curtained off corner of the open work space. 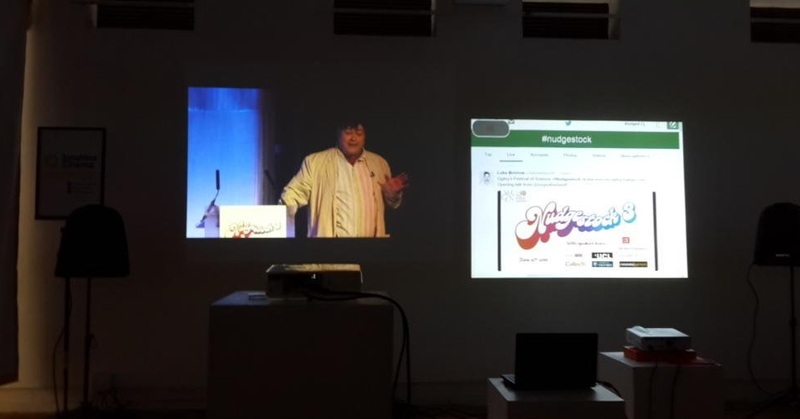 The 2015 conference itself was brilliant as usual, with the added bonus of hosting the inaugural Nudge Awards, a function introduced to expose the best practical applications of the sorts of ideas and findings shared by the speakers. It was all of this that made it that much more exciting as my fellow co-founder, Sebastian, and I boarded the international flight to London this year. A week jam-packed with meetings, talks, exploration and ending with a day at Nudgestock hosted in the lovely seaside town of Folkestone, UK. It didn’t hurt that one of our first and most successful projects for the Big Issue South Africa had been selected as one of nine finalists for the Nudge Awards either. We landed in London with our feet firmly on the ground and ready to go, heading straight into week of connecting and sharing ideas with people in and around the field of Behavioural Change. With the industry still in it's infancy in South Africa, this was a massive opportunity for us to learn and discuss approaches, business models, service development and market focus areas with some of the best and brightest minds out there. The learnings, connections and enjoyment gained from our whirlwind week were, alone, worth the cost of the trip, and something we hope to build on going forward. By the time that Friday rolled around we were already up to our ears in new and interesting ideas… and that was just the beginning! Boarding the bus to Folkestone early Friday morning, I overheard a conversation about the challenges of applying Skinner's models in non-laboratory settings. It’s the type of discussion that you just don't hear on your daily commute to work, and exactly the ‘pinch’ I needed to awaken to the fact I was finally going to be attending the event that I had been watching so entranced, through my laptop, for the last three years. The venue in Folkestone was Leas Cliff Hall, a beautiful structure overlooking the English Channel. I entered the buzzing hall, full of behavioural enthusiasts with coffee or tea in hand, all deep in conversation with one another and no doubt as eagerly anticipating the start of the event as I was. Who wouldn't be with such an incredible line up this year, including the likes of Isabel Behncke, Molly Crockett, Tim Harford, Tali Sharot, Dave Trott, Paul Craven, Robert Colvile and Rory Sutherland. Each one of them was thoroughly engaging and yet also entirely unique, offering the audience a wide range of ideas on subjects such as moral psychology, evolutionary sociology, behavioural economics, investor behaviour, marketing, creativity and technology. It's really tough to pick stand out performers but, if I had to choose, first prize would have to be Molly Crockett's talk on moral transgressions and how they corrupt our perceived value of money. A big take out for me was her work around the human tendency to behave hyper-altruistically, but that this tendency is disrupted when dopamine is stimulated, tilting people to act in a more self-interested manner. Isabel Behncke's talkwould come a close second. She spoke about the biology of play and the important role that it plays in forming the high levels of trust needed for long-term cooperation. Isabel's idea was nicely summed up by Rory Sutherland at the end of her talk. Ideas like these and many others were whizzing around my head, fueling absorbing conversations with fellow audience members during the breaks. I was completely immersed in the day, and entirely distracted from the Nudge Awards and our nomination. I was quickly pulled back to reality by a tap on the shoulder from one of the senior members of Ogilvy Change. He guided Sebastian and me over to a quiet corner, away from the crowd, and in a calm yet formal tone told us that, as per tradition, the winners of the gold Nudge Award was told in the break before the final session so that they had time to prepare. I still remember standing there, frozen for a second in disbelief, as if my brain didn't quite know what to do with the information it had taken on, or the correct sort of emotional response required. This state was soon replaced by genuine excitement (as well as a hint of anxiety), which grew with the realization that a collection of actual words had to be strung together in a coherent manner, and communicated to an audience of some of the finest thinkers in our field. No pressure! The next session went by in what felt like moments. I remember drifting between the enlightening conversation by Tali Sharot on optimism bias and a furious house-of-commons-like debate going on in my mind around the decision about what I was going to say. One group argued convincingly that speeches are a death trap and I should avoid them by saying as little as possible, whilst another saw it as an opportunity to share as much as possible, including my position on the replication crisis (a popular topic on the day) and the counter-intuitive benefits it has created for the business world. Fortunately a healthy middle ground was reached, allowing me to settle and enjoy the experience. You can watch our acceptance of the award below. We returned home bursting with new ideas, new connections and a new award- a tangible reminder of a sure highlight in the life of Gravity Ideas so far. It's definitely going to be a memory that I savour for many years to come.